"The Huawei P30 Pro is ready for anything. With a powerful processor, massive 60 hour battery life and incredible quad camera system, it’s a serious piece of kit that’s pushing the boundaries." How does the P30 Pro look and feel? With double-sided curved glass, the P30 Pro looks stunning and feels comfortable in your hand. With a 6.4” Full HD+ OLED screen, games and movies will look better than ever, so boxsets on the go have never been more immersive. In four beautiful gradient colours that move as the phone catches the light, the P30 Pro looks stunning from every angle. You’ll catch everyone admiring it. If your current phone just can't take a decent image in a low light setting, the Huawei P30 Pro is going to make taking photos a lot easier. With light fusion sensor technology, you’ll get high quality detail and colour even in dark settings like a bar – so you can get a great selfie of everyone in the club or get professional looking fireworks shots. With a Leica quad camera system featuring a 50x telephoto zoom, this is a smartphone camera with some serious skills. Even if your subject is far away, you'll get great shots that are still super high quality and blur-free. What’s going on inside the P30 Pro? Fuelled by a Kirin 980 AI chipset, you've got the power to play online games, edit your photos and use even the most draining apps without getting slowed down – the P30 Pro will take it all on, and make it look easy too. Forgot to plug in last night? We've all done it. The P30 Pro offers a whopping up to 60 hours battery life from a single charge - so you can get through almost 3 days without needing to worry about charging. Leave the powerbank at home. If 128 GB just isn’t enough for your photos and music, there’s a microSD card slot to give you up to another 256 GB – pack in your boxsets for a whole entertainment system on-the-go. What’s new in the Huawei P30 Pro? From a quad-lens rear camera, four amazing colour options, wireless charging and the incredibly fast Kirin 980 processor, the Huawei P30 Pro is jampacked with incredible features for you to take advantage of. How long does the battery last in the Huawei P30 Pro? The battery inside the Huawei P30 Pro can last for up to a whopping 60 hours. That means you can fall asleep forgetting to charge and still have enough battery lofe to get you through the second and third day. The P30 Pro also boasts their SuperCharge technology. Charing your phone to 70% power in just 30 minutes. 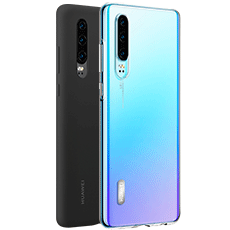 What colours does the Huawei P30 Pro come in? The P30 Pro is here to make a statement with its bold colour options. From Amber Sunrise, Breathing Crystal, Aurora Blue and the classic Black. You can choose the colour that most suits your personality. What’s the camera like on the Huawei P30 Pro? Featuring the Leica Quad rear-camera, the Huawei P30 Pro packs a punch with photography. Featuring a SuperZoom Lens, 40 MP Sensor, 20 MP Wide Angle and TOF camera, you’ll be able to capture incredible pictures at lowlight without any struggles. Letting you become a pro photographer straight from your smartphone no matter where you are. Does it the Huawei P30 Pro have wireless charging? It does indeed. In fact, it can also do reverse wireless charging. Simply pop into the settings section of your P30 Pro and enable the reverse wireless charging feature to charge up your friends smartphone when it’s running low on juice. What is the screen like on the Huawei P30? The Huawei P30 Pro features a 6.47-inch OLED display at FHD+ resolution. That’s 2340 x 1080, giving you crisp and precise colour when watching your favourite tv series on-the-go or showing off your holiday photos to a friend. Does the Huawei P30 have a headphone jack? The Huawei P30 Pro doesn’t have a headphone jack; however, you’re supplied with USB-C wired headphones, so you can listen to all your tunes straight out of the box. Does the Huawei P30 Pro have expandable storage? With optional 128 GB or 512 GB of internal storage, you can also add up to 256 GB of storage with the Nano SD slot on the Huawei P30 Pro. Lots of space for everything you could ever wish for on your smartphone. With a slim but solid screen protector, a handy portable car charger and a sturdy protective case, the Huawei P30 Pro Essential Bundle will keep your phone protected and charged.